Have a baby on the way? Or getting ready for another addition to the family? Regardless of whether you’re a new mom or a veteran, deciding on the safest, most affordable products for your new baby can be daunting. That’s why we’ve round up this newborn baby essentials list with new moms in mind, so you can get everything you need. From feeding to clothing, we’ve got you covered. These bottles work best with the Medela breast pump, but they work just fine without as they’re just a standard size baby bottle. Either pump directly into the bottle or pour in from another container and store them for future use. Medela bottles are great for breast milk as well as formula and can be cleaned quickly using your dishwasher or wash it in the sink. The bottles are made of BPA-free plastic and they cannot be broken. The MSRP is $14.99 for a 6 pack of bottles, but check the current Medela Bottles – Amazon price. While this is our best overall pick, please click here to see all our Top 5 picks in this category. This formula is the highest rated baby formula across the US and most of North America. And for good reason. It’s the closest synthetic milk substitute to real human breast milk. The use and focus of whey protein instead of casein help baby digest the formula easier, faster, and with less upset tummies. Easy to mix and stores for up to 24 hours in the fridge. And with an MSRP of $29.99 for the big tub, your money will go a long way. But definitely check the current Similac Pro-Advance – Amazon price first. The MSRP of $380.00 may seem steep but you get so much with this electric breast pump. Like all Medela pumps, this one attaches directly to the bottle which makes for less chance of contamination of the milk. It’s portable, lightweight, easy to use which is why moms love it. You can pump hands free. All parts are BPA-free, easy to clean, and the battery is rechargeable. What more could you ask for in your first breast pump? Check the current Medela Freestyle Breast Pump – Amazon price and have it delivered right to your door. When you have a newborn baby, you’re constantly getting up. All day and night. So a bassinet with wheels is your best bet. Plus, the extra storage underneath means you can have everything you need within arms reach. Lightweight, breathable, and can even lull your baby to sleep with a gentle sway, this is the bassinet all new moms need. It has an affordable MSRP of just $150.00, too, but click here to find the current Graco Dream Suite – Amazon price. If you have a newborn, then you’ll want a trusted baby monitor that can work with all of your smart devices. The iBaby M6T does just that and more. It gives a total 360-degree view of them room so you can see baby from any angle. It’s Wifi compatible, works with 3G, 4G, and LTE, has temperature and humidity sensors, and even plays almost a dozen lullabies. To top it off, it has a very affordable MSRP of just $159.95. But always check the current iBaby M6T – Amazon price. There are tons of reasons why the Mamas and Papas Apollo Bouncer is the right choice for new moms and babies. It’s lightweight, easy to carry around, low to the floor, has a machine washable cover, a toy bar to keep baby entertained, even music and/or vibration mechanics to help soothe baby to sleep. All for an MSRP of only $99, you can’t beat that, but check out the current Mamas and Papas Apollo Bouncer – Amazon price right now. Not only is this great for newborns, but this playpen is the only one you’ll ever need. Easy to fold for quick transport, built-in storage and containers for wipes or other necessities, and a removable infant layer to keep baby at your level. The Joovy Room Playard has an MSRP of only $270 and even has an additional music/white noise/nightlight mechanism included. 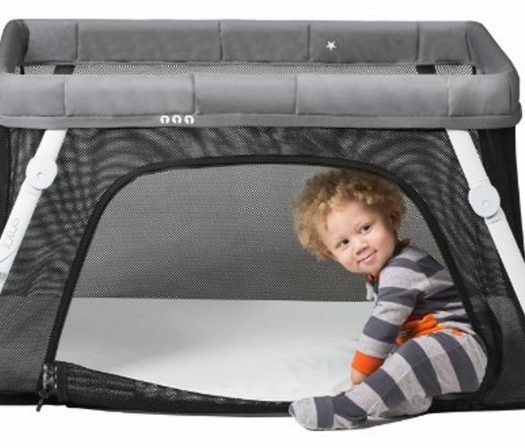 But check out the current Joovy Room Playard – Amazon price here. Safety when traveling is the number one concern for new parents. But with this car seat, you can rest assured knowing that baby is in good hands. Tested and exceeds all safety standards, easy to install, can be both rear and front facing, and grows with your child. The Graco Contender 65 has an MSRP of only $140 but check the current Graco Contender 65 – Amazon price here. The best thing about this stroller is that it’s so versatile. The seat is able to be adjusted all the way back into a laying position which is great for napping babies. It also has a large canopy to give lots of overhead cover, is easy to fold, and only weighs a meager 12.8 lbs. Really, this is the only stroller you’ll ever need to buy as it grows with you and baby. With an MSRP of $495, it can seem a bit steep, but check the current Babyzen Yoyo – Amazon price here. For those parents who wish to have a car seat and stroller that work together, then a travel system is what you need. The Chicco Cortina has an MSRP of only $299.00 and you get a car seat with high safety standards that’s easy to install or remove, can be rear or forward facing, and clicks in place right on the stroller. Easy to use, safe, and totally affordable. You can’t go wrong. But check the current Chicco Cortina Travel System – Amazon price here. After giving birth, the last thing you want to do is bend down to bath baby, let alone anything else. That’s why a baby bath tub that fits right in your kitchen or large bathroom sink is the way to go. The 4moms Infant Tub has an affordable price and you get a quality made tub that’s roomy, lightweight, easy to clean, and even has a built-in display to show when water is too hot, too cold, and just right. With an MSRP of $80, check the current 4moms Infant Tub – Amazon price here. Whether or not you baby has super sensitive skin, wipes with the least amount of chemicals is what you should be looking for. These particular baby wipes literally have just two ingredients; water and grapefruit extract. Extremely eco-friendly, safe to you on any part of the body (even face), and super affordable at an MSRP of $32.99 for a big box of 540 wipes. But check the current Water Wipes – Amazon price here. Diaper rash, or any skin irritation, can cause baby extreme discomfort and pain. Be sure to protect their delicate skin with a good diaper rash cream. Phthalate and paraben free, this cream is good for all babies and any skin irritation. Burt’s Bees Diaper Ointment has an MSRP of $8.99 for a 2oz tube and it’ll go a long way if used correctly. Don’t forget to check the current Burt’s Bees Diaper Ointment – Amazon price here. For the first 6 months, a baby usually only wears a variety of onesies and sleepers. But buying clothing in individual pieces can get expensive. That’s why a great newborn baby clothes set like this one is such a great choice. You’ll get 23 pieces in total; short sleeve and long sleeve onesies, sleepers, burp clothes, receiving blankets, bibs, hats, and mittens, this set is literally all you need and for an MSRP of just $49.99 you’re saving a ton of money. But check the current Spasilk Set- Amazon price here. When toting around a newborn, you need as many free hands as possible. That’s why a backpack is the better choice for a diaper bag. The Graco Gotham Diaper Backpack has an MSRP of only $49.99 and can carry all your essentials like diapers, wipes, bottles, toys, etc. It’s even got a foldable change pad included to make your life easier so you can change baby pretty much anywhere. And you can check the current Graco Gotham Diaper Backpack – Amazon price here. When it comes to diapers, you probably want the one you can trust. Pampers has been around for many years and has perfected their diapers. The cool Absorb Away liner help draw moisture away from baby’s skin and can last up to 12 whole hours. They even have a handy indicator strip right on the front that changes color when the baby is ready for a change. Pampers Swaddlers has an MSRP of $53.99 for a big box of 216 diapers, size 1 (which is what you want for newborns) but check the current pampers Swaddlers – Amazon price here. Being a new parent is hard. Make things easier on yourself by choosing just the right products for you and baby so you can rest assured that you have everything you need, and the best of what’s out there. Here, we’ve covered everything from feeding to play and even the must-have basic clothing. But while just buying the essentials on this list will work for most parents, we still encourage you to check out our Best Of articles for each of these categories because you may find that while these products will work for anyone, there might be a few other variations that are slightly better for your specific preferences.